Kanye West -- prolific rapper, honorary Kardashian, and notorious wearer of extremely long T-shirts -- has a gift for creating controversy. He's Twitter's personal pot-stirrer. And the latest of his charades, embedded in a sea of Election Day tweets and quippy calls to action, is an online feud that you neither know nor care about: he has scorned the good name of famously slow fast food purveyor Burger King. The heated charade began this past Sunday with a tweet from Mr. Ye, innocently enough declaring McDonald's his favorite restaurant (never mind the fact that he is rich enough to bathe in champagne and caviar and that he recently purchased franchise rights to three Burger King locations). Naturally, as a life-long competitor, Burger King did not take kindly to the news that America's favorite artist/basket case had pledged his allegiance to Mickey D's. First thing Monday morning, local and international BKs did what fast food chains apparently do best: they tweeted back. You might have thought that was plenty of unrelated pre-election Twitter drama for one 24-hour period, but that's where you're wrong! The feud continues! The battle forges onward! In response to hundreds of thousands of likes and retweets, Burger King UK went for an encore performance. It remains to be seen whether or not Mr. West will bother with a reply, but for once, someone else has the floor. After hitting the polls today, thousands hit Twitter to congratulate Burger King on a fight well-fought. They may be slow, but they are not without wit. Burger King UK, whoever you are, you’re running the probably best twitter account in the world. Damn. 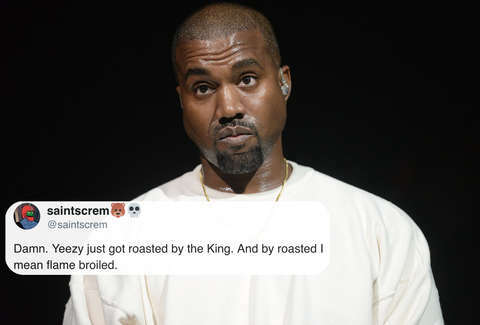 Yeezy just got roasted by the King. And by roasted I mean flame broiled. BUT WAIT. In the end, the unrivaled winner was neither a Kanye West nor Burger King affiliate. Instead, it was none other than Wendy's. While previously uninvolved in the online brawl, the chain managed to beat all odds with an utterly flawless tweet of their own. Cheers to you, Wendy's, and thank you for your candor. And there you have it, a noble victory. What now, Kanye?